Merry Christmas and Shalom, Y’All! We had American food for Thanksgiving in Jerusalem, so I guess it makes some sort of sense that we had Jerusalem food in Florida for Christmas. One of my presents from Jer was the phenomenal Jerusalem, a gorgeous cookbook by Yotam Ottolenghi and Sami Tamimi — an Israeli Jew and an Israel Arab who grew up at the same time but in different worlds in Jerusalem. I love everything about this book — the stories, the recipes, the luscious-looking photos. Since our usual Christmas dinner buddies, Bill and Paula, are away this year, we decided to hold off on the annual turkey until family comes next week. Our plan was to have shrimp and pasta and ratatouille so we had some fat, briny gulf shrimp and a couple of eggplant in the fridge. Jerusalem changed my menu in a heartbeat. I made an absolutely drop dead amazing eggplant dish that instantly soared to the top of my list of favorites. It’s called something like Eggplant with onions and lemon and that doesn’t tell you the half of it. You split the eggplants, salt, pepper and olive oil them and roast for 45 minutes in a hot oven. Meanwhile you sauté a bunch of thinly sliced onions in olive oil until they are deep brown. Add chopped chilies, sumac, and cumin and sauté until fragrant. Add some crumbled feta and heat til melted. Make a separate sauce of peeled, minced lemon, crushed garlic and chilies. When the eggplant is soft and browned, pull from the oven. Spoon the lemon sauce over them and let it soak in. Top with the onion mixture. This was so darned good I ate a whole globe eggplant. Spicy, aromatic, rich and unctuous — it was beyond wonderful. For the shrimp I made a dish that called for scallops and clams as well as prawns but as I didn’t have any, prawns it was. 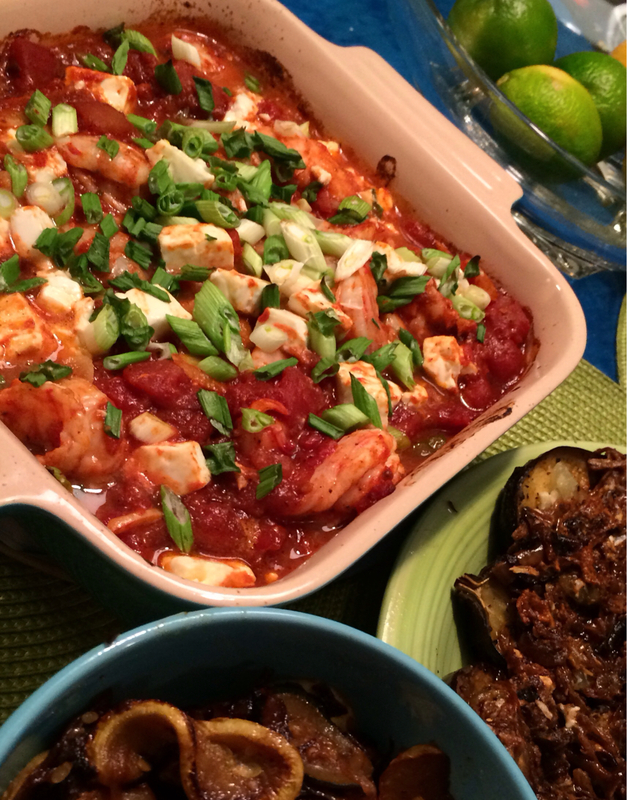 They were baked in a savory feta-studded tomato sauce with white wine, garlic, oregano and lemon zest. Perfect. The house has an aroma that is still making my mouth water long after dinner is over. The tree is twinkling in multiple-colored delight and thanks to a good friend our palm trees out by the bay are flashing red and green. The breeze of the water isn’t very balmy tonight, but it is a heck of a lot warmer than it is in Bloomington. It’s not a perfect world, but it’s a good one. Merry Christmas and Shalom, y’all!! Sounds fabulous. I have to get that cookbook! Try the roasted cauliflower salad. It’s amazing.